Golden-800 series banknote counter suitable for most currencies in the world. Large LCD display with 7digit count, 3 digit batch, 3 digit message, easy maintenance with self-diagnostic system. 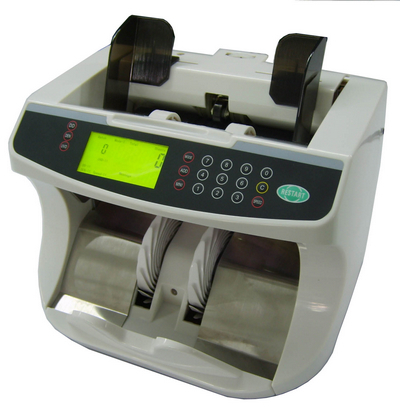 It can count accurately and can detect counterfeit with double note detection (DEN), DD-height size detection, UV-counterfeit detection, MG-magnetic ink detection, MT-metal thread detection, Inferred character detection, bring machine superior accuracy and performance. This machines excellent performance, 1600 notes/min high counting speed, competitive performance and price & elegant outlook, was customer's best choice.